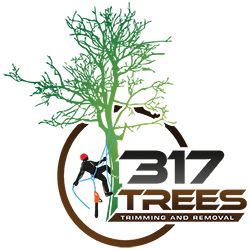 At 317 Tree we have provided all of our employees the proper training and education to safely prune and trim all your trees correctly and in accordance with the International Society of Arborist standards. There are several important reasons for pruning a tree. Clearance: The most common reason to prune a tree is to provide clearance from structures, overhead wires, and other trees. Tree limbs that are to close to a roof can cause physical damage and water damage. The roof is not given the chance adequately dry after wet weather. Squirrels and other animals can use tree limbs to gain access to your attic. Branches that are close to overhead wires can produce dangerous situations and can cause interruptions in utility service and or fires. Health and structural: Trees can be pruned to promote health and vigor as well as to increase the structural stability of a tree. Pruning trees improves air flow between the branches and allows for better sunlight penetration. A properly pruned shade tree dries quicker which makes it much less susceptible to insect attacks and fungal diseases. A properly pruned tree will also allow wind to path through the tree and reduce the chances of damage during high winds. Removing weak crotches and rubbing or crossing branches helps the tree stay strong and healthy. Removing dead wood reduces your liability and the risk of damage to objects on the ground from falling limbs. Safety and Aesthetics: A properly pruned tree is not only safer it's beautiful and increases your property's value assessment! For a free estimate on trimming your hedge, please call us at (317) 344-TREE or click here. 317 Trees takes care of hedge trimming, along with our tree trimming service. We always clear up after themselves, even sweeping pavements and driveways as needed and dispose of the hedge trimmings in an environmental and responsible way. As with our hedge cutting service we can schedule our visits as often as you need to keep your hedge in good condition throughout the year. We recommend trimming hedges and bushes at least once a year, but depending on the type of hedge maybe twice. Trees are not a problem! From shaping and reducing to felling and dead-wooding, a fully trained and insured service is supplied by us. Contact us now for a no obligation quote and we can instantly transform your garden by pruning your hedges and trees so they look exactly the way you want. At 317 Trees, we try to provice our customers with exceptional service, the best possible price, and an overall friendly experience that you would expect from professionals and that sets us apart from all the competition.